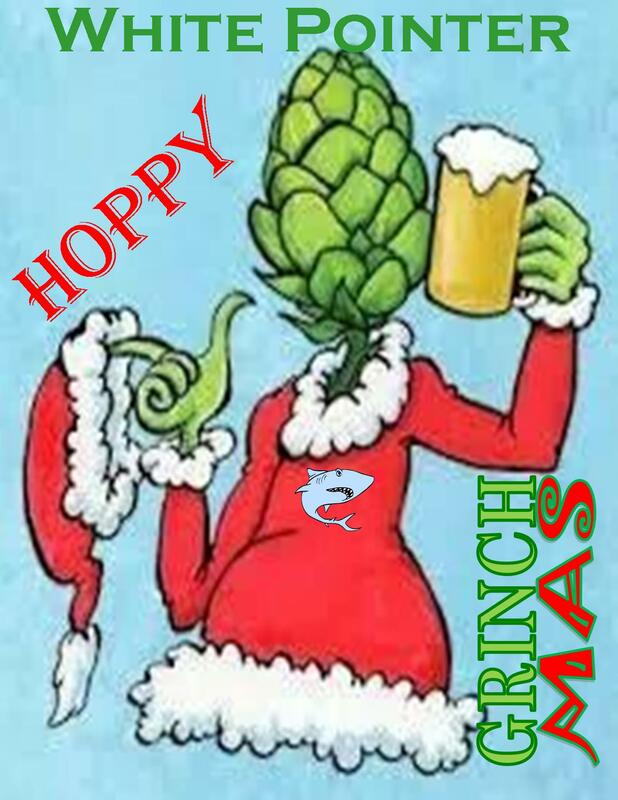 On 11/11/14 I brewed my second winter seasonal beer, Hoppy Grinchmas. This beer is an Imperial Red Ale. I’ve been wanting to make one of these for some time. I had one by Revolution called Red Skull that I thought was great, Lagunitas makes a great one just called Imperial Red, and I also really enjoyed Blood of the Unicorn by Pipeworks. There are a number of other great beers of this type, these were just the first to spring to mind. The thing these reds have in common is that while they have a strong hop presence, they aren’t red IPAs. After the hop bite up front, there is a nice balance of hop flavor and malt. There should be nice bread like notes, as well as some caramel malt sweetness, and maybe some slight dark fruity flavors. There should be some nice body to this beer as well. The holiday season seemed like a good time to brew this beer. 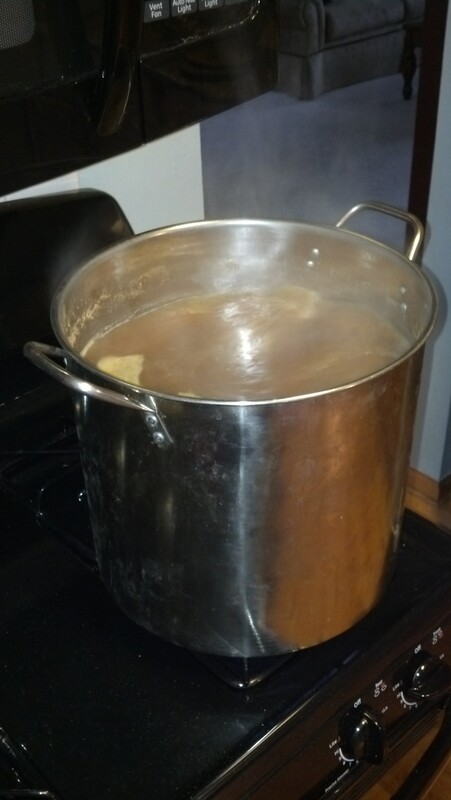 The past two Christmas seasons, I had brewed a spiced ale similar to Great Lakes Christmas Ale. While I enjoy those beers, I always get tired of spiced beer about half way through the batch, so I decided to try something new. This beer was a 2.7 gal batch going into my little keg fermenter. I still have quite a bit of beer in the fridge from prior batches, and I just brewed a big batch of my Black Rye IPA, so I kept this one small. Plus, this is a new recipe that I’m trying here, so this is a bit of a test batch too. On to the brew day itself. I did this on my stove top on my day off commemorating Veteran’s Day. Thanks to all who served so that I have the freedom to enjoy this hobby, and I have friends and family who are vets, so special thanks to them. The day went pretty smoothly. I did a couple last minute recipe adjustments. These were small, and the main one was adding a couple ounces of DME. I realized just prior to brewing that I typically have been getting less than 75% efficiency on my small batches, so I adjusted with some DME to correct that. I mashed at 154 for an hour. My sophisticated stove top small batch setup. 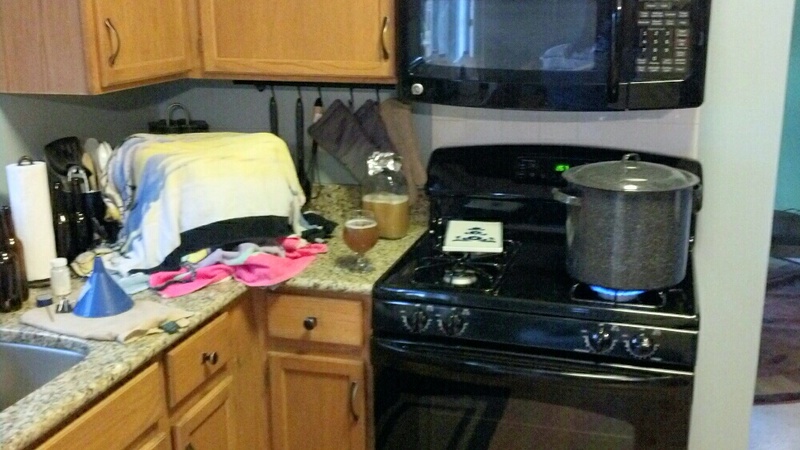 The towels are wrapped around my mash tun/brew kettle to keep the mash temp steady. I boiled for an hour and then took the kettle outside and ran my chiller. It was a pretty cool day out, and the water from the outside faucets is getting cold, so chilling a small batch went quick. I took my hydrometer reading, and the OG was 1.077, just one point off. I pitched my liter yeast starter of Wyeast 1098. All in all it was a pretty relaxed brew day. I was alone, just me and the dog, so I had some movies going all day while I brewed. Quite a bit different from the social events I like my brew days to be, but it was relaxing. I’m really interested to see how this beer turns out. My only fear is the last time I brewed a hoppy style in the Mr Beer keg, it oxidized. I’m not sure if I messed up the transfer at bottling, or if the Mr Beer kegs lack of an airlock is the culprit. We’ll see soon enough. I plan to ferment this for a week and a half, dry hop for another five days, and then cold crash a couple days before fining with gelatin. In order to appreciate the red color this beer will hopefully be, I need it to be nice and clear. Tasting Update 12/15/14: I missed an update at bottling for this one, but it went smoothly. My FG was 1.013, so a bit dryer than expected, but that’s ok. Appearance: This beer pours a nice clear reddish amber color with an off white head that sticks around. The beer left nice lacing on the glass. I’m really happy with the clarity on this one, I used gelatin after cold crashing to help clear it up. I’d like it to be a bit more red though, I’m thinking a bit more of either roasted barley, or sub that with some black malt or something. Smell: The aroma of this beer is pretty balanced. There’s some hop aroma up front, a bit of pine and citrus. Behind that is a nice bread like malt aroma and some fruity yeast aroma. A nice smelling beer. Taste: This beer is hoppy but still pretty balanced, which is what I’d hoped. There’s a nice bitterness upfront which gives way to some citrus flavors such as grapefruit and orange. Behind the hops though is a firm malt body. There’s a nice mix of baked bread and caramel sweetness. There’s also some fruity English yeast esters, which are a bit more noticeable than I’d hoped, especially since I don’t think this got above 65 or 66 while it was fermenting. I had intended on using WLP 007 Dry English Ale yeast over the Wyeast 1098 British Ale, but my LHBS was out of the 007 and told me that 1098 was basically the same strain. After using both, I find the 1098 to be a bit more fruity and tart, which isn’t what I wanted here. Next time I think I may just go with an American yeast on this beer. All that being said, the beer tastes great, jut slightly more “English” than I’d like. The hops and malt are still the stars of the show here, the yeast doesn’t overshadow that. Mouthfeel: The beer is medium bodied, with a bit of a dry finish. The beer attenuated a bit more than I expected, so the beer came out a bit dryer and stronger than I’d planned, but its pretty easy drinking for an 8.5% abv beer. 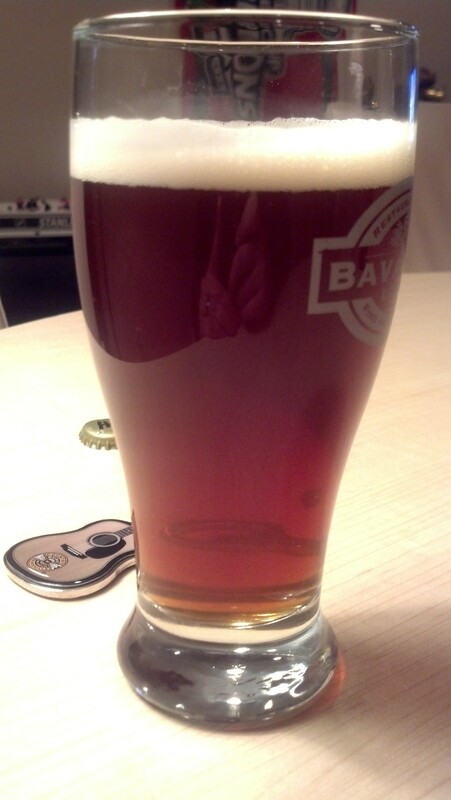 Overall: I’m pretty satisfied with this one, especially for this being my first imperial red ale. Its got some great malt and hop flavor. There’s nothing I’d change with the hop bill, and the only change to the malt bill would just be to get it a bit more red. As I said above, I wouldn’t use the 1098 yeast with this beer again, and will probably use an American yeast next time. All in all, I’m happy with it, and definitely prefer it to the spiced ales I’ve brewed the past couple winters.